A new innovative way for removing stubborn stains easily with only sponge and water. 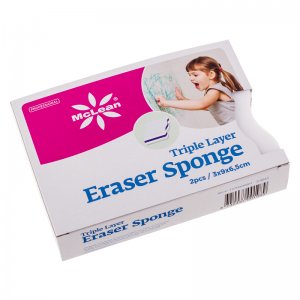 This unique melamine sponge removes quickly and easily dark stripes from the walls and floors, fingerpints and soot marks and other dirt from windows, doors and furniture; as well as soap and water stains from bath, sink and ceramic tiles. Outer layers are made of strong melamine, inside layer from high density porolone, which enables to retain its shape and moisture, in order to provide excellent cleaning results. Moisten the sponge with water and start cleaning. Test first on the back side or bottom corner of the item, in order to avoid possible damage to the material.